Okay, my overall approach was probably fundamentally flawed and really misses the mark on the ‘how to win friends and influence people’ scale, but this is very typical of the responses I hear from men. I’m not a promoter of diet drinks for their own sake, but if you want a sweet drink I think the choice is a no-brainer. Sugary drinks – and fruit juice is in this category as it contains exactly the same amount of sugar as regular Coke – are a worse choice than a diet drink. Sugar is relatively toxic to the body. Aspartame is probably not. What the heck does “probably not” mean? That’s a very good question. The answer is that there isn’t much evidence, especially experimental evidence with humans, showing adverse health outcomes. Don’t you hate it when researchers sit on the fence and say that sort of stuff? 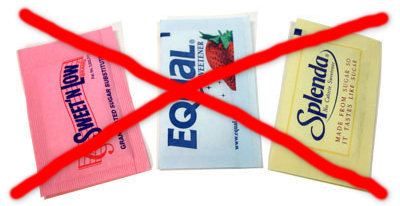 There isn’t convincing evidence that sweeteners don’t harm you either. So it’s a double edged sword. The reality is that you would be better off drinking water. But that’s not the social and environmental reality of the world we live in. I’m saying that all things being equal, I’d prefer the diet drink to the full sugar version. OK, I hear all the paleo, whole foods guys screaming – and I hear you. But how do you balance that approach with the pragmatism of public health? (clue: think about our approaches to reducing smoking which is obviously bad for you). Here’s why I would take a more pragmatic approach to sweeteners. First, all foods are made of chemicals. Nutrients are chemicals. Too much or too little of any nutrient has adverse effects. In other words, when we exceed our biological capacity to deal with a nutrient it is almost always a problem. This is why high carb diets are a problem for some people. Aspartame, when synthesised, breaks down into phenylalanine (an amino acid), aspartic acid, and methanol – all of which are found naturally in foods. So I think it’s a matter of perspective and harm with sweeteners. We can deal with these substances in small amounts. This isn’t everyone’s view, but I think there is now enough evidence to make this recommendation a public health one. In other words, on the continuum of water being the best and sugary drinks the worst, sweetened drinks and meals fit somewhere in between. That’s different than a personal health choice. It might be considered “harm minismisation”. Some people will say that by drinking sweet (even artificially sweetened) drinks you are giving people a taste for sweet stuff. My response is that we already like sweet stuff and no amount of abstinence from sugar will completely cure our taste for it. That being said, lower carb, sugar free diets do go a long way to curing the actual addition many people develop. Through sweeteners, food technology allows us to enjoy sweetness without the sugar. Besides aspartame, which can have an aftertaste that some people find off-putting (and was originally developed as a fly spray which is even more off putting), there are two other popular sweeteners available in New Zealand: Splenda and Stevia. Splenda is sucralose, which is made from sucrose (normal sugar), but with a refining process that reduces the calories. Because sucralose is inert (not metabolised) in the body it is calorie free. This product looks and feels a bit more like actual sugar and doesn’t have the same aftertaste as aspartame sweeteners, so it is much better for cooking and baking. Stevia is a natural plant extract. In New Zealand it is sold under the name Sweete in 2 g sachets, which contain 1 calorie. Compared with sugar, the onset and duration of sweetness is slower and longer. Stevia is, however, about 16 times sweeter than sugar, the 2 g sachet providing the same sweetness as a teaspoon of sugar. So if you are worried about being natural, this plant-extract additive is pretty good. On balance, I much prefer the Stevia sweetener. None are likely to stimulate an insulin response on their own. I acknowledge that actual experimental trials with these substances on humans will never happen because that research is unethical. So we are left with only some prospective study showing no harm. That’s not that convincing. A study out last week in the journal “Diabetes Care” showed something very interesting. The paper by Pepino et al was entitled “Sucralose Affects Glycemic and Hormonal Responses to an Oral Glucose Load“. So you can see from the title that Sucralose (Splenda), although on its own doesn’t stimulate an insulin response, combined with glucose does magnify the glycemic and insulin response and area under the insulin curve. That’s interesting. I have no idea why that would happen, whether it happens with other sweeteners, how much glucose is required for this response, or whether it applies in slimmer subjects (average BMI was 42). In any case, it is a bit of a warning about Splenda in particular. Not sure about the others. Watch out for emotional claims about research in this space. Here’s a great example of one about the above paper which is titled “Splenda and Sucralose shown to contribute to the development of diabetes“. That seems to happen all the time in this field. Let’s agree that absence of evidence isn’t the same as evidence of absence. But let’s also agree that the evidence just isn’t their yet for the outright harm of these substances. So will they make you fat and sick? They might, but sugar is more likely to do so. Are they harm free? Probably not entirely, but in an obesity epidemic let’s be pragmatic in public health. ← Bliss – Cheez doodles, Menthos, and Chocolate bars? Great post Grant. And lets retrain our palates so we can rely less on sweet foods. and enjoy those flavours too.